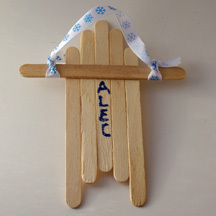 Kids’ names fit perfectly on these little sleds that can be hung from the Christmas tree or in the classroom. What You Need: 6 craft sticks; length of ribbon; glue; glitter glue. How to Make It: Arrange 5 sticks in sled shape as shown, touching and on a flat surface. Spread glue on back of sixth stick and place it across the base, about 1 1/2″ from the top. Let dry and tie on ribbon. Use glitter glue to write child’s name. Optional: You could punch or cut out little mittens, hats and boots to glue to the sled to look like someone is using it! This entry was posted on Thursday, December 20th, 2007 at 10:58 am	and is filed under Christmas crafts, Popsicle stick crafts, winter crafts. You can follow any responses to this entry through the RSS 2.0 feed. Responses are currently closed, but you can trackback from your own site.